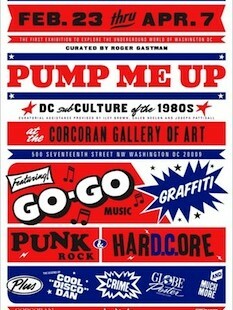 Browse: Home » Pump Me Up! Last Thursday I had the opportunity to join a visiting group of students from MICA’s curatorial graduate program on a tour led by the curator of Pump Me Up, Roger Gastman. He tailored his discussion to the collection and display of objects, describing the process, success, and failures of mounting a show involving pop and cultural ephemera in an established fine art museum. He mentioned a few times how Sarah Newman, curator of contemporary art at the Corcoran, insisted that he include original, “real art,”from established artists who had been shown in museums before, and not just Go-Go posters and record covers. While the exhibit contained a mixture of media, the “real art”was unfortunately mainly photographs. There were a couple of reproductions of street art fabricated by local artists based off of archival photographs that Gastman had researched. Tucked away down a short hallway leading to administrative offices were a couple of jackets on loan from the artists’ families, along with some of their other personal objects. Sadly, I feel that the context Gastman wished to provide through displaying those pieces were most likely overlooked by most visitors as it was rather tucked away. On the other hand, common street signs and posted lined the hallway to the restrooms and were clearly visible from the atrium. Gastman even mentioned his delight at seeing visitors spend so much time taking in all of the artifacts in the hallway. I personally appreciated the personal sketchbooks located hallway along the timeline. Done by Corcoran students, they were later incorporated into cover designs by DC bands at the time, including Minor Threat. The most intriguing design element was the use of the bright Go-Go posters in the rotunda, encircling visitors with their neon chunky text and bold layouts. This is where our tour ended and where Gastman sadly mentioned the negative review the exhibit received from City Paper. I was rather surprised as they were the media sponsor of both the exhibition and Gastman’s new documentary. As he mentioned throughout the tour, the toughest part of curating a show is striking a balance of objects and story and not being able to show everything you want based of space, timing and expense. He felt they unjustly focused on the missing elements, details he insisted he either couldn’t fit in or didn’t feel they were as important as the objects he did select. I did feel as though the show was erring a little on the promotional side of things with the release of his new documentary on “Cool”Disco Dan and the emphasis given to him within the exhibit as well. Curatorial prerogative, I suppose.